A new generation of race toys have arrived! Based on the new hit Anime cartoon series [which currently airs on Cartoon Network-check your local listings], Scan2Go is not your ordinary race track and car set. Each car is activated with Power and Turbo scanable barcode cards [cards are easily scanned by swiping through the vehicle like a credit card] and the combination of cards that you scan will determine the actual speed of the vehicles. We are absolutely loving the concept of these Scan2Go racing toys, as well as the collectibility. You can expand easily on the starter sets [currently available in the Circle Starter Set pictured above or a Figure 8 Starter Set] by adding new vehicles, new packs of Turbo & Power cards, and expansion track sets. The vehicles are designed to remain in constant motion [with 2 front and two back side wheels] and the track is incredibly sturdy, which allows the Scan2Go cars to achieve high rates of speed without mishap. The track is super simple to assemble and requires no tools [ 5-10 minute assembly time]. Note: A Phillips head screw driver is required to install batteries in the included car. Check out our full video review/hands on demonstration of the Scan2Go Circle Race Track Starter Kit below. 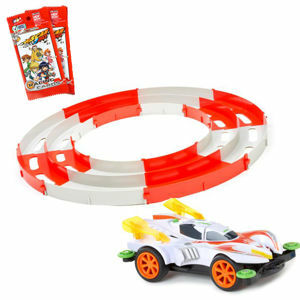 Visit http://www.littletikes.com and let me know which Scan2Go item [aside from the Circle Race Track Starter Set] you would like to gift this holiday season [in a comment on this post]. Open to U.S. residents. Entries must be received by November 16, 2012 at 12 PM PST. Reader(s) will be drawn at random through www.random.org and must confirm their shipping details within 48 hours from the time that the email notification is sent (or another winner will be chosen in place). I'd also like to get the Scan2Go Car - Slazor. #1 I Follow One Savvy Mom on Twitter. #2 I Follow One Savvy Mom on Twitter. #1 I Follow One Savvy Mom on Pinterest. #2 I Follow One Savvy Mom on Pinterest. #1 I Subscribe via RSS Feed. #2 I Subscribe via RSS Feed. #1 I Like" Little Tikes on Facebook. #2 I Like" Little Tikes on Facebook. #1 I Follow Little Tikes on Twitter. #2 I Follow Little Tikes on Twitter. I like the scan and go "falgor" car also like that you can buy additional track pieces.